Adults who want or need a straighter set of teeth may dread the idea of having to wear braces again. Afraid of what people will say to a grown man or woman wearing braces, some may avoid the dental treatment they need for straighter and healthier teeth. Fortunately, there is a clear option to help align one's teeth without being obvious about it. EZ-Align® is the affordable aligner solution that can straighten teeth without alerting others to the use. Patients may not need to bother with metal wires, ceramic brackets or other forms of braces and can use a no-hassle solution. With EZ-Align®, cleaning is not difficult as patients can remove the aligners and clean separately. Patients may believe that products like EZ-Align® are too good to be true. In reality, EZ-Align® is a simple but effective process. While metal braces are still effective, adults will greatly benefit from EZ-Align®. At Fort Lee Family Dental, we understand that patients may have a few questions about EZ-Align®. EZ-Align® is the clear aligner that can straighten teeth through a tray-style system over time. Customized for each individual, EZ-Align® will include a series of aligners that the patient alternates through every two weeks or so. The gradual process will straighten the teeth without pain. Once the time to change to a new set arrives, the patient will switch to another pair of aligners that matches the current state of his or her teeth. EZ-Align® is made of crystal clear thermal plastic that is durable and long-lasting. After using EZ-Align®, patients will have the aesthetically pleasing and fully functional smile they desire. The process to straighten one's teeth with EZ-Align® may only take a few months, depending on the condition of the patient's teeth. While other methods are effective, EZ-Align® has the fusion of both a desirable appearance and an effective treatment method. The system will gradually straighten teeth as the patient goes about everyday business. The patient will want to visit an orthodontist and see if EZ-Align® is the right choice for his or her situation. Depending on the situation, another treatment option may be a better recommendation for the patient. By visiting Fort Lee Family Dental, we can help discern if EZ-Align® is right for you. 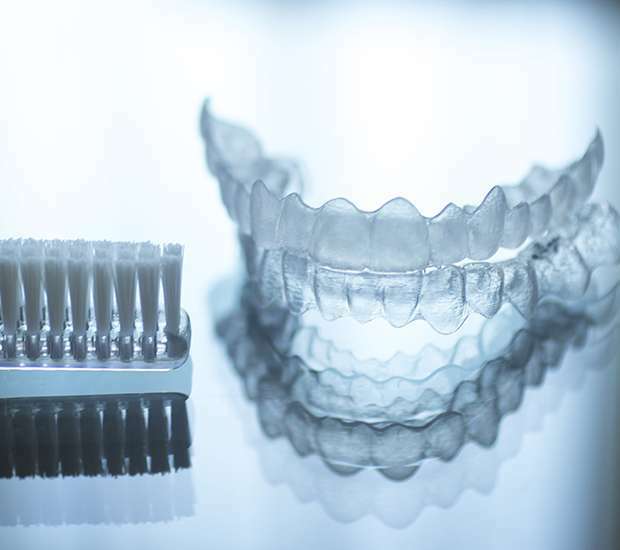 At Fort Lee Family Dental, we will make sure the lab customizes the EZ-Align® trays to each patient. Once we take a mold of the teeth, we will go over a treatment plan, switching aligners every 2 to 3 weeks or so. The appointment to create the mold for the aligners will not be painful as our staff will make sure the patient is comfortable. Fortunately, the patient will not experience an incredible amount of pain with each new aligner. The only problem can arise if the patient switches aligners too early or does not take care of the aligners. At our office, we will go through all the necessary steps for taking proper care of the teeth and the EZ-Align® aligners. Will EZ-Align® drastically alter my life? Patients choose EZ-Align® for several key reasons. The first key reason is that EZ-Align® is clear and not very noticeable. People do not need to feel embarrassment when visiting friends, speaking at an important meeting or other social situations. With EZ-Align®, patients can avoid the long procedure to install metal braces and the trouble of cleaning teeth that comes with them. With EZ-Align®, patients will have no issues removing the aligner to clean their teeth any time of the day. The patient will wear EZ-Align® for around 20 hours per day, but can easily remove the aligner as necessary. This effective solution will help patients receive the smile that they deserve, boost confidence and produce a straighter set of teeth. Regardless of if you had braces as a child or not, teeth can move back out of alignment over time. Crooked teeth are not only less appealing to the eye but can also lead to tooth infection over time. When gaps appear between teeth, food and plaque can become caught in there. If the plaque or food particles are left there for too long, they can lead to infection. Straight teeth will help to avoid this scenario. An adult who is in need of straighter teeth can seek EZ-Align® at our office as an easy, efficient and strong alternative to braces. With EZ-Align®, a patient can continue through life as normal while straightening his or her teeth over time. At Fort Lee Family Dental we will help you obtain the perfect and healthy smile you have always wanted. With EZ-Align®, patients can have a straight smile and a fully-functional set of teeth. EZ-Align® will not drastically obstruct one's daily schedule and may be the right choice for you. If you are interested in EZ-Align® clear aligners or need us to replace some lost aligners, give us a call to schedule an appointment. We will go over options and determine if clear aligners are the best treatment for straightening your teeth. Give us a call at (201) 620-9772 today. At Fort Lee Family Dental, we are pleased to provide patients throughout Fort Lee with a more convenient way to straighten their teeth. To find out if clear orthodontics are right for you, call 201-620-9772. Aligner therapy is the teeth-straightening process in which the patient continues the applied pressure of the teeth with a series of aligners and seeks professional checkups from the dental professional. DynaFlex® is a company that produces a variety of anti-snoring oral sleep devices and other dental products with precision and durability. Enamel reduction is a process that dental professionals will use to remove a small amount of tooth enamel for specific surgeries or restorations, such as veneers. The EZ-X® is a product that one may wear before beginning the clear aligner process in order to help reduce the need for enamel reduction during aligner therapy. Intermediate tooth alignment is the process in which an orthodontic device gradually adjusts the position of the teeth and straightens them. Medical grade thermoformed material is a type of material for products like aligner trays to match the shape and form of a patient’s teeth. An orthodontic laboratory specializes in developing orthodontic tools and appliances to help correct and straighten teeth. PVS Impressions consist of Polyvinyl Siloxane and is a liquid that can quickly hardens into a rubber-like solid to provide a professional impression of the teeth.